Following a rocky launch, World War 3 is a flawed online FPS that also boasts a handful of interesting ideas of its own. Saying that World War 3 had a rough start would be an understatement. After technical issues led to the online modern first-person shooter launching later than planned, problems would only persist. The thousands of people lining up to give the game a shot couldn’t connect to the servers in the first two days. Subsequent patches seem have to alleviated the issue, at least for some, with the game’s steam rating moving from Mostly Negative to Mixed. Personally, I could only reliably join servers today, but prior to that I managed to take a bite out of a luck cookie and got the chance to play a handful of matches. What they revealed was an online modern FPS that needs work but also shows potential and a handful of interesting ideas. Any war needs its factions and the two battling it out in World War 3 are named, rather simply, West and East. There doesn’t seem to be much difference between the two, aside from default starting loadouts. Prior to getting down and dirty in a proper match, you’ll be met with a world map featuring four available conflict zones, which coincide with the playble maps currently available. Before the progression system was taken offline, finishing a match would reward supplies, alongside currency used for unlocking different weapons. These supplies could be spent to aid the war effort in the four areas granting passive bonuses like extra ammo, or increased vehicle power when doing battle. While I can’t say that I truly felt the effects of any of them in the matches I’ve played prior to launch, this is just one of World War 3’s neat ideas – that of having members of a faction contributing earned supplies towards unlocking gameplay bonuses for actual battles. There was even mention of a Tactical Nuke as a season reward, although I couldn’t speak for the full implications of that. Navigating and making sense of the UI takes some getting used to. Particularly when it comes to weapon customization, it’s easy to get lost in menus within menus while dealing with tooltips that aren’t that descriptive to begin with. 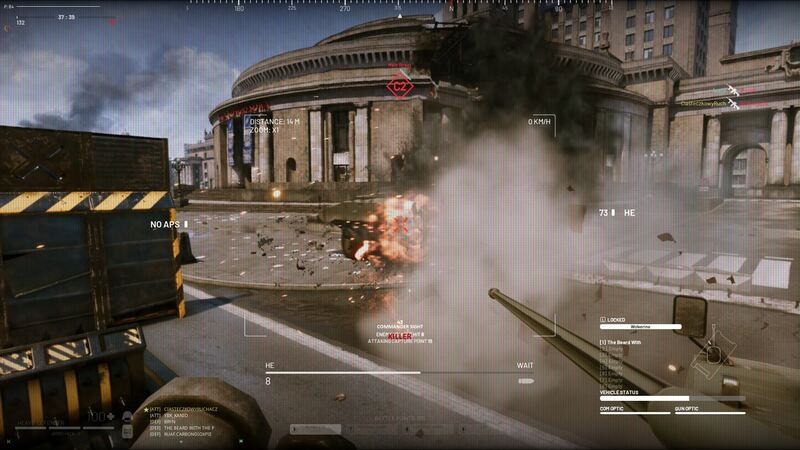 The situation doesn’t change much in-game either, as elements like available killstreaks and point markers crowd the screen, despite being a tad hard to read. Part of this is due to their lean design. Requesting and issuing squad-wide attack or defend orders only takes one push of a button and is clearly relayed to the player. Requesting ammo or health, although done just as easily, is thoroughly ineffective as long as you’re not in an organized group on voice coms. Friendly players have markers on them, indicating equipped gadgets and their availability. Pressing a button while looking in their direction prompts your soldier to vocally request ammo or health, but there doesn’t seem to be any feedback on the receiving end. This, unsurprisingly, resulted in most of my cries for help going unanswered. Mechanics like switching sights or locking vehicle entry are only explained in temporary tooltips. That, on top of inexistent tutorials means you should expect to not know very well what you’re doing during the first couple of matches. World War 3’s Warzone mode is a slightly altered take on Battlefield’s Conquest which sees capture points linked to each other. In order to earn score towards winning the match teams needs to hold both points in an area. While the maps don’t quite go for Battlefield 4’s insane size and verticality, they’re not small either. They offer a good variety of spaces to fight in. 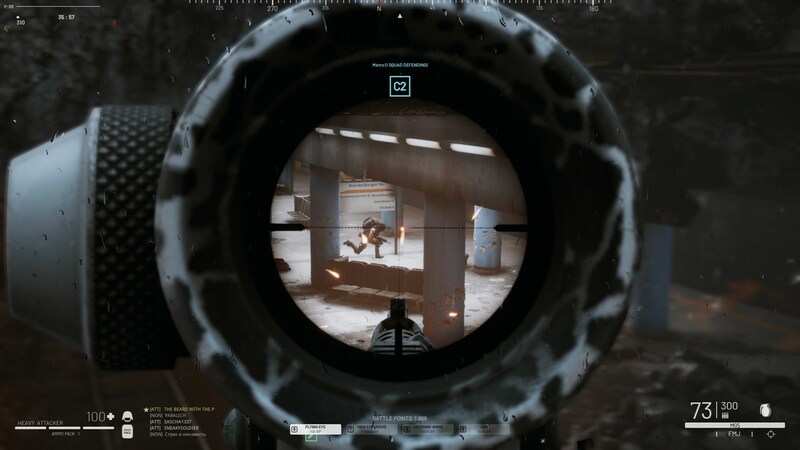 After holding a metro station from enemies pouring in both from the crater in front and from a small door on the side, I followed a squad mate out into the open, attempting to move to the area’s linked point. As opposed to its underground counterpart, it was on a street with a handful of vehicles providing cover opportunities. Getting to those vehicles, however, required a bit of a sprint out in the open which rendered us vulnerable to stray snipers or any other foe that happened to be around. The maps cater to both creating choke points and flanking, to fighting both inside and outside, which does encourage looking for ways to gain a tactical advantage. Furthermore, World War 3 allows you to pick the Attacker or Defender roles rewarding extra points for either pushing aggressively or staying back and defending, which could incentivize people to chase kills less at the objective’s detriment, in what’s already a team-focused game. Most of the matches ended because of the timer ticking down, rather than the point cap being reached, making for fairly lengthy sessions. Unsurprisingly, I spent a good portion of this time running between objectives, which also resulted in a surprise death or ten. This was, in part, due to the matches never actually reaching their 64-player cap, instead hovering around 28 at most. As players left and joined, it wasn’t a very consistent experience, but one that did, nonetheless, offer plenty of gunfights. World War 3’s modern arsenal packs a punch and brings serious lethality to bear. Accurate short bursts quickly down foes and getting caught in the open is an easy death sentence. Hold your trigger on the finger and serious recoil kicks in after a few shots. Annoyingly enough, I didn’t find a way to hold breath while sniping, and grips didn’t seem to do a whole lot to stabilize the weapon. World War 3 leans more towards the realistic side of things, in this respect, also including friendly fire. I’d actually go as far as saying that most of the guns are a little too unruly. Long range combat is awkward when you’re not using a sniper rifle and compensating for recoil on automatic weapons is fairly difficult. 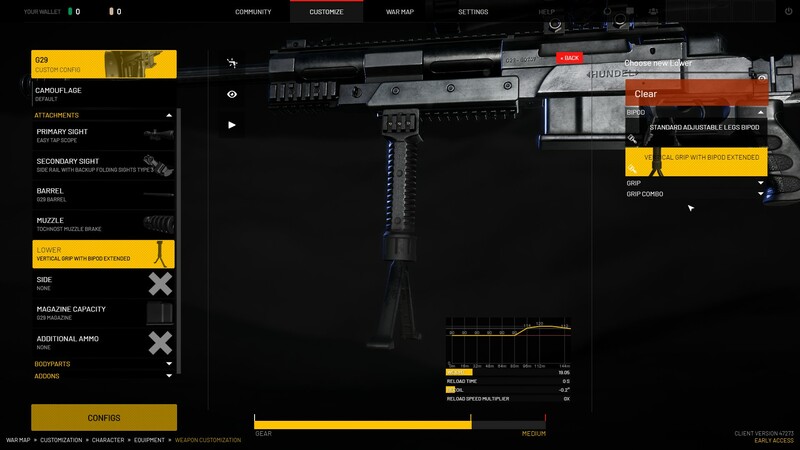 Extensive customization allows for attaching two different scopes, carrying more ammo types and even changing individual parts of the weapons like the barrel and grip. The more stuff you carry, the slower your soldier moves. Speaking of movement, it has received a good deal of attention as well. You can go prone, slide, run while crouching, land or roll on your back. Each of these actions takes time, which means you won’t be ninja ducking under bullets like some badass action hero. While I didn’t find myself using all it offers too often, it’s definitely great to see it implemented in this way. Oh, you can lean around corners too, which is something FPS titles seem to forget about a little too often nowadays. That being said, I’m not too fond of how easily it is to die. 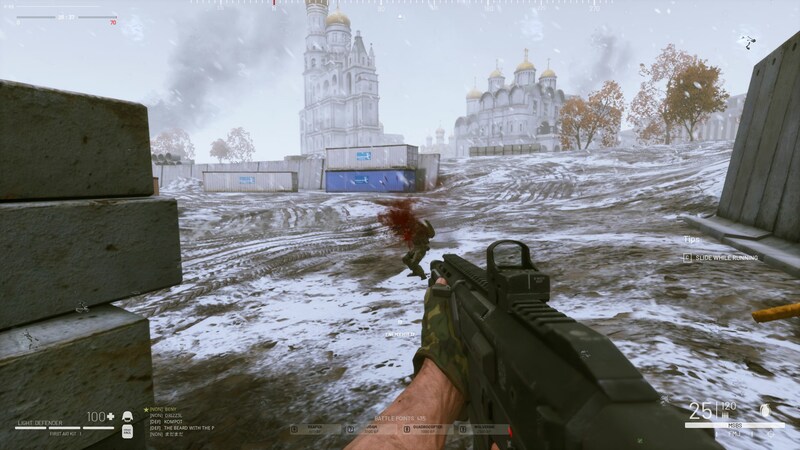 Whether a symptom of World War 3’s armor system, lack of killcams or whatever else, I bit the dust a few too many times without a chance to even glimpse where the bullet came from. There’s an emphasis on using all the cover you can get, but it’s not always readily available, less so when the game spawns you in clear view of an enemy. World War 3’s armor system mitigates damage only in the areas of the body covered by armor pieces. While I can’t vouch that it works 100% as intended, hitting the fleshy bits of one’s head or back with a sniper rifle did result in instant deaths. Color coded damage indicators use blue to indicate hitting armor and grey to show when shots deal minimal damage. Weapon switching takes time – the RPG requires a few seconds of assembly before being ready to fire – which I found to be another neat touch, as you need to consider your surroundings when doing so. Killing foes and helping the team capture points grants Battle Points which can be used to call a suite of scouting drones, artillery, airstrikes and even vehicles on the map. I never saw more than three vehicles in play at any given time but they too have a similar armor system. You can also damage a tank’s optics rendering its driver blind and unable to distinguish between friend and foe, which is another of World War 3’s neat little touches; just like having to wait for the tank’s barrel to turn or having projectile trajectory impacted by elevation. To aid with the latter, a second crosshair shows the area where your shot will actually land. The vehicles themselves can absolutely wreck an unprepared enemy. Conversely, it only takes a couple of RPG-wielding soldiers to hound tanks and APCs down and turn them into flaming husks. The first time an enemy tank rolled past me at full speed it took me by complete surprise as its engine was barely audible. I expected a quad bike and got blown to bits in an instant by an armored behemoth. Vehicles also lack a sense of weight, feeling as if they’re made of cardboard while driving. The volume of footsteps is all over the place. Not only does it sound like you’re taking twice as many steps while moving, there were times when I heard footsteps right next to me despite nobody being there. The RPG sounds particularly flat, taking away from the thrill of landing a shot on an enemy vehicle and stripping away parts of its armor. The dev team needs to take a closer look at the audio mixing. Then there’s a whole suite of texture bugs alongside stuff like starting with close to no ammo, ammo crates not giving enough bullets and even misaligned or overlapping gun sights. Perhaps not entirely unexpected, my experience with World War 3 proved to be an uneven one. World War 3 picked the right moment to come out, as shown by the thousands lining up to give its Early Access version a shot. It’s a pity it had as rocky a launch as it did. If you do manage to get in, you’ll find its progression and world map interactions disabled, – which does mean you’ve access to the entire arsenal from the get go – alongside no hope of your loadouts being saved the next time you boot the game up. While I can’t say that it constantly gripped me, it has enough elements to make me curious as to how they will blend together further down the line. I took part in a good number of intense firefights, whether one-on-one or as part of a combined effort to attack or defend a contested point. From its lethal gunplay to its Warzone mode and neat small touches, which are clear signs of dedication, there’s enough to be curious about here. But it’s not all great, as the title has its share of flaws that the devs need to address.